The Fountain Pen Network is back + new features! You can now reach FPN without seeing the scary bright red Google warning. The FPN Admin Team has posted a topic saying the Malware Problem is Fixed. Not only is FPN back up and running, but there are a few new features to the site as well! Now you can share an interesting topic with new share buttons! They appear at the bottom of the page just above the fast reply box. Next to your controls you now have a box that shows how many messages you have the lets you preview them! The search feature has been changed so that it is now more streamlined. You can now choose where you want to search in the search bar. Once you have searched you’ll find that the advanced search page and the search results pages look a lot better! Also take a look at your profile page. It also has a new look! A giant thanks to the FPN staff for FPN getting back up and running once more. Have you noticed anymore changes? If so, do let us know about them! When you clicked on the icon by a person’s name, you used to get a little flyout box that had a topic option – clicking it would give you a list of topics that person had posted in summary format. 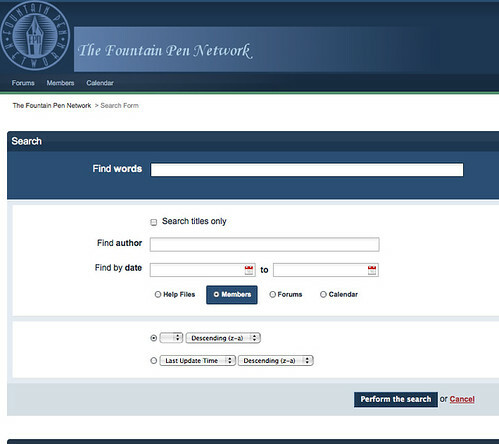 Love the added features – makes it easier to navigate searches. I am very new to this form of communication, but interested in learning about pens, inks. I have two pens, one bottle of Sheaffer’s blue ink, and eight journals, including three Moleskines behind me. I am so happy that I found others with the same passions, you have no idea. Thank you to biffybeans for gently turning me in this direction! Jerry, I’m so glad you are enjoying the hobby! It is a pleasure/relief to find that one not the only one who enjoys writing instruments and all the accompaniments!